Prepare For "The Most Important Week Of The Year"
It's supposed to be a week when many in Europe are on their to, if not already at, their first summer vacation, while Wall Streeters are enjoying the lovely weather and debating whether to stay in the Hamptons a little bit longer. Well they won't, because as Bank of America's FX strategists preview, the coming week "could be the most important week of the year." Here's why: from the next round in the escalating trade war in the post-shocking G7 world which has seen Trump and Trudeau engage in a "low brow" fight, to the historic Trump-Kim summit, to the all important US CPI report (the US economy is now on the verge of overheating), to the UK parliament's Brexit vote, to no less than three major central bank announcements from the ECB, BOJ and FOMC, of which the latter is expected to delivers its latest rate hike, the 7th of the cycle, while Draghi may announce the end of QE, from continued deterioration in Italian markets and the latest Italian bond auction especially following the latest "deposit flight" Target2 data, to Vladimir Putin meeting with Saudi Crown Prince Mohammed bin Salman at the opening game of the World Cup soccer tournament potentially moving the oil-market, it will be a non-stop bonanza of one market-moving headline to the next. The UK Parliament will vote on the EU withdrawal bill on June 12. This bill copies all existing EU legislation into UK law, ahead of actual Brexit. Theresa May will have to overturn a number of Lords amendments leading to a soft Brexit. The most difficult include the role of the Parliament to approve the final Brexit deal and the UK participation in the EU customs union after Brexit. We have argued that the latter is the best option for the UK for now, as there is no time for new trade deals with third countries. The Lords have asked for the UK to remain in a customs union with the EU and this has also been the Labour's position. However, this has been a red line for the hard Brexiteers. Theresa May has been trying to find solutions around it, which have been rejected so far by both her own party and the EU. She may not have the votes next week to overturn the Lords' amendment on this, which will be a defeat, increasing political uncertainty. Monday: A fairly quiet start to the week with the only releases of signifiance coming from Europe with the May Bank of France industrial sentiment print, and April industrial and manufacturing production, and trade data in the UK. Brexit Michal Barnier to discuss the state of talks. It's worth noting that German Finance Minister Olaf Scholz is also set to discuss EU reform in a panel interview. 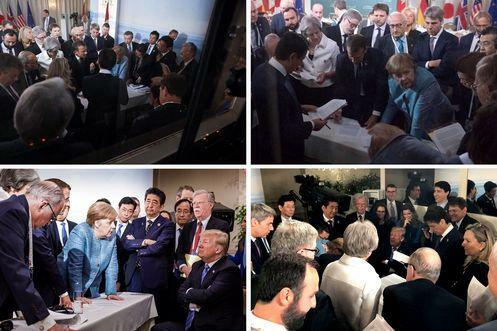 On the political scene, Bloomberg notes that investors get their first opportunity to pass judgment on what happened at the summit of leaders from the Group of Seven. The gathering ended with President Donald Trump broadsiding allies via Twitter, potentially causing fresh friction over trade; already in early trade the CAD is trading well lower. Tuesday: All eyes will be on Singapore on Tuesday with President Trump set to meet North Korea's Kim Jong Un in an historic summit. Trump last week predicted “great success” and said it’s possible he could sign an agreement with Kim to formally end the Korean War. Back in Washington, the government releases a monthly report on inflation that will be a key gauge of how hot -- or not -- the U.S. economy is getting. In terms of data, the big highlight on Tuesday comes in the afternoon in the US with the May CPI report. The May NFIB small business optimism reading and May monthly budget statement will also be out in the US. Prior to this in Europe we'll get the June ZEW survey in Germany and April/May employment data in the UK including average weekly earnings. In Japan the May PPI report is also due. Meanwhile, UK Parliament is due to hold a 12-hour session on Brexit legislation with various amendments due. Wednesday: All eyes will be on the Fed on Wednesday when we get the outcome of the FOMC meeting, followed closely by Fed Chair Powell's statement. Prior to that we get the May PPI report in the US, while in Europe we'll get May CPI prints out of the UK (along with RPI and PPI) and Spain. April industrial production for the Euro area is also due. Also on Wednesday, Argentina’s central bank is expected to keep its benchmark rate 40 percent as it tries to stabilize the peso, while Italy’s auction of debt will draw scrutiny by handing investors another opportunity to react to the election of the populist government and its promises of hefty spending increases. The risks for the securities are already seen in the fact that the gap between Italian 10-year yields and those of Spain is at its widest since 2012. In the U.K., inflation data will help the Bank of England determine whether to raise interest rates. Thursday: The focus switches to the ECB on Thursday with their latest monetary policy meeting due in the early afternoon, followed by President Draghi's press conference. Prior to that we are due to get final May CPI revisions in Germany and France, while in China May retail sales, industrial production and fixed asset investment is due. In the UK May retail sales data is due while in the US the main data release is also the May retail sales report. The May import price index reading is due too in the US along with weekly initial jobless claims and April business inventories data. Vladimir Putin will meet Saudi Crown Prince Mohammed bin Salman at the opening game of the World Cup soccer tournament. The encounter could influence the global oil market given it comes a week before a crucial OPEC meeting in Vienna, providing a last-minute chance for the two leaders to iron out a possible oil-output increase. Friday: The final central bank meeting of the week will see the BoJ conclude their monetary policy meeting in the early morning. 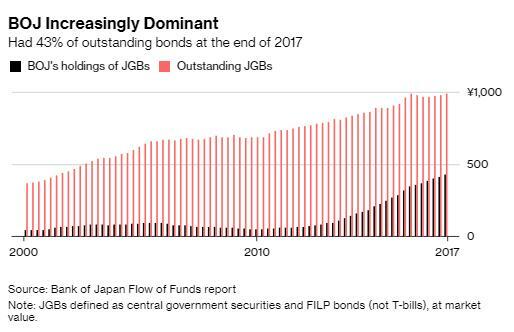 As Bloomberg notes, the BOJ is still buying vast quantities of Japanese government bonds and will have been encouraged to keep doing so by data showing its still far off its 2 percent inflation target and that the economy shrank in the first quarter. Datawise, the final May CPI revisions for the Euro area will be made along with that for Italy. In the US we'll get June empire manufacturing, May industrial production and the preliminary June University of Michigan consumer sentiment survey. Finally, June 15 is the deadline for the U.S. to publish the final list of Chinese products subject to $50 billion in tariffs, which could be imposed shortly after. Also today, the Russian central bank sets interest rates with economists currently leaning toward no change in the 7.25 percent benchmark although there is a chance of a cut. And just in case there is confusion about the importance of this week's events, here is Deutsche Bank agreeing with BofA, and writing that there's a plethora of potentially pivotal and market sensitive events worth keeping an eye on next week. The ECB, Fed and BoJ will all hold monetary policy meetings, while the unprecedented summit between President Trump and North Korean Leader Kim Jong Un is also on the cards. Data releases include US CPI and retail sales as well as final CPI reports throughout Europe and China, while Brexit developments shouldn't be too far from the spotlight. The ECB might well be the most potentially interesting of the central bank meetings next week on Thursday after the coordinated signals sent by ECB speakers this week that the meeting is a live one for debating the end of QE. 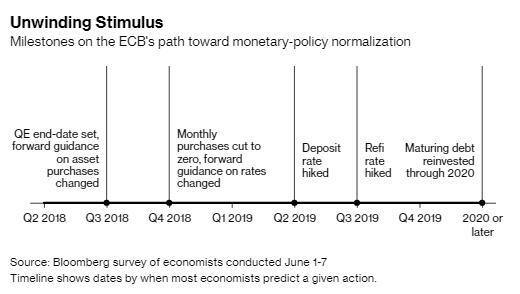 Between BofA and DB, and everyone else, indeed the general feeling now is that we'll get some sort of announcement, and while Draghi may refuse to discuss what he said, most economists continue to expect QE to end in December 2018 following a Q4 taper. It's worth noting that next week's meeting will also contain new economic projections from ECB officials so that'll be worth watching. Warming up the ECB will be the Fed on Wednesday. The overwhelming consensus is for another 25bp hike, a view shared by our US economists. As a reminder this is a meeting which includes a Powell press conference and also an updated summary of economic projections. The minutes to the last meeting didn't necessarily indicate whether the one additional vote needed to move the median dot from three to four rate hikes this year would be forthcoming at next week's meeting although data since then, and especially pricing pressure, has been slightly stronger than expected at the margin. Meanwhile, BofA upgraded its forecast to 4 hikes this year from 3 previously, while the market is assigning a 43% probability of that happening; DB also expects 4 as does Goldman. The final central bank meeting next week is the BoJ on Friday. No surprises are expected with policy expected to stay unchanged although some mixed comments on the state of the economy from Governor Kuroda in recent weeks could be a focus. Away from central banks, the watershed geopolitical moment for politics next week is the planned meeting between President Trump and North Korean leader Kim Jong Un on Tuesday in Singapore. It's almost impossible to predict what may or may not happen in terms of a deal being struck, and balancing sanctions relief versus denuclearization, but its almost certain to be a highly sensitive event for markets either way. The first meeting kicks off at 9am local time (2am BST, 9pm EST). Outside of central bank meetings and the Trump-Kim Jong Un showdown, the US CPI report on Tuesday for May is the big data highlight next week. As has been the case for the 31 months before this one (but of which only 17 have been correct), the consensus is for a +0.2% mom core print which would lift the annual rate one-tenth to +2.2% and the highest since February last year. The headline is expected to also come in at +0.2% mom which would push the annual rate up two-tenths to +2.7%. In terms of other US data next week worth keeping an eye on, one day after the CPI report and just hours before the Fed decision we'll get the May PPI report on Wednesday where current expectations are for a +0.3% mom headline reading and +0.2% mom core reading. On Thursday we'll then get the May retail sales report with the consensus currently pegged at +0.4% mom for the headline, and +0.3% mom for the control group (which as a reminder goes into the GDP accounts). Finally on Friday, the May industrial production print will be closely watched (+0.3% mom expected) as well as the preliminary June University of Michigan consumer sentiment report. In Europe outside of the obvious ECB meeting, the rest of the week will also be about inflation data. Final May CPI revisions are due to be made in Germany and France on Thursday and the Eurozone on Friday. The latter is not expected to show any change from the +1.1% yoy flash reading for the core. It's worth noting that the rise in May resulted in our European economists revising up their 2018-year end forecast by one-tenth to +1.4% yoy. Meanwhile, the UK CPI/PPI/RPI report will also be out on Wednesday (our economists expect RPI to rise to +3.5% yoy and headline CPI to hold at +2.4% yoy) while CPI prints in Spain and Italy are due on Wednesday and Friday, respectively. Outside of that the June ZEW survey is due in Germany on Tuesday and May UK retail sales on Thursday. Elsewhere, it'll be difficult to keep Brexit headlines out of the spotlight next week too with UK Brexit Secretary David Davis due to meet EU Chief Negotiator Michal Barnier in Brussels on Monday, and then the UK Parliament is due to hold a 12- hour session on Brexit legislation including the various amendments proposed, on Tuesday. A few other events to keep an eye on next week include the conclusion of the G7 meeting tomorrow in Quebec, the first round mayoral elections in Italy on Sunday which should test the new populist government support, German Finance Minister Olaf Scholz discussing EU reform in a panel interview on Monday, and EU Trade Chief Cecilia Malmstrom speaking on Friday in Brussels. 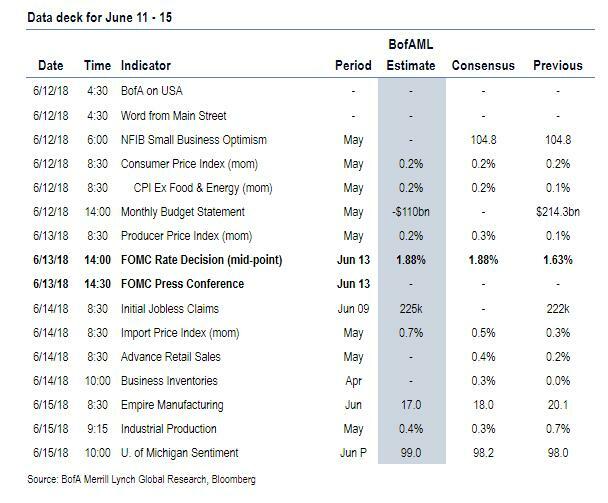 Below we lay out Goldman preview of key US events, together with consensus forecasts: according to the vampire squid, the key economic releases this week are the CPI report on Tuesday and retail sales on Thursday. In addition, the June FOMC statement will be released on Wednesday at 2:00 PM EDT, followed by Chairman Powell’s press conference at 2:30 PM. 08:30 AM CPI (mom), May (GS +0.18%, consensus +0.2%, last +0.2%); Core CPI (mom), May (GS +0.19%, consensus +0.2%, last +0.1%); CPI (yoy), May (GS +2.72%, consensus +2.8%, last +2.5%); Core CPI (yoy), May (GS +2.24%, consensus +2.2%, last +2.1%): We estimate a 0.19% increase in May core CPI (mom sa), which would boost the year-over-year rate by one tenth to 2.2%. We view the risks to the year-over-year rate as skewed to the upside (i.e. 2.3% is more likely than 2.1%). Our forecast reflects a boost in the recreation category from the Amazon Prime price increase, as well as a rebound in airfares and second-derivative improvement in the new and used cars category. We also expect firm increases in owner’s equivalent rent and medical services. We look for a 0.18% increase in headline CPI, reflecting modest expected inflation in the food and energy categories. 08:30 AM PPI final demand, May (GS +0.3%, consensus +0.2%, last +0.1%); PPI ex-food and energy, May (GS +0.2%, consensus +0.2%, last +0.2%); PPI ex-food, energy, and trade, May (GS +0.2%, consensus +0.2%, last +0.1%): We estimate a 0.3% increase in headline PPI in May, reflecting firmer core prices, as well as higher food and energy prices. We expect a 0.2% increase in the core PPI and the PPI ex-food, energy, and trade services categories. In the April report, the producer price index was slightly softer than expected, reflecting weaker food prices but relatively firm upstream prices. 2:00 PM FOMC statement, June 12-13 meeting: As discussed in our FOMC preview, we expect the FOMC to raise the target range for the fed funds rate by 25 basis points at the June meeting. In the post-meeting statement, we think the committee is likely to retain the upbeat tone of recent meetings, with an acknowledgement of lower unemployment and a hawkish rewording of the forward guidance. In the Summary of Economic Projections (SEP), we look for: (1) unchanged GDP growth projections, (2) a higher median headline inflation projection for 2018, unchanged core projections, and lower unemployment rate projections in 2018-20, and (3) a pull-forward of rate hike projections so that the median dot for the funds rate to show four rate hikes in 2018 (up from 3 projected in March), three hikes in 2019, and one hike in 2020. 08:30 AM Retail sales, May (GS +0.4%, consensus +0.4%, last +0.2%); Retail sales ex-auto, May (GS +0.5%, consensus +0.5%, last +0.3%); Retail sales ex-auto & gas, May (GS +0.5%, consensus +0.4%, last +0.3%); Core retail sales, May (GS +0.4%, consensus +0.4%, last +0.5%): We estimate core retail sales (ex-autos, gasoline, and building materials) rose at a brisk 0.4% pace in May, reflecting solid chain store sales results that continue to receive a boost from tax cuts. Warm weather is also expected to boost sales in the building equipment category. Based on a pullback in auto SAAR but a seasonally adjusted rise in gasoline prices, we estimate a 0.4% and 0.5% respective increases in the headline and ex-auto measures. 08:30 AM Initial jobless claims, week ended June 9 (GS 225k, consensus 222k, last 222k); Continuing jobless claims, week ended June 2 (consensus 1,734k, last 1,741k); We estimate initial jobless claims rose by 3k to 225k in the week ending June 9. Claims have trended slightly higher in recent weeks, and we expect another modest increase reflecting filings related to the Memorial Day holiday in the prior period. Consensus expects continuing claims—the number of persons receiving benefits through standard programs—to fall back 7k to 1,734k. 09:15 AM Industrial production, May (GS +0.2%, consensus +0.2%, last +0.7%); Manufacturing production, May (GS -0.2%, consensus +0.1%, last +0.5%); Capacity utilization, May (GS +78.0%, consensus +78.1%, last +78.0%): We estimate industrial production rose 0.2% in May, as the mining category likely rose further and the utilities category was mixed. We expect manufacturing production declined, driven largely by weak auto manufacturing. We estimate capacity utilization held steady at +78.0%. 10:00 AM University of Michigan consumer sentiment, June preliminary (GS 98.6, consensus 98.5, last 98.0): We estimate the University of Michigan consumer sentiment index edged 0.6pt higher in the preliminary estimate for June, as a moderate increase in the stock market likely offset a small decline in high-frequency consumer confidence measures. The report’s measure of 5- to 10-year inflation expectations remained at 2.5% in May, near the middle of its 12-month range.